Sub: Quality Education initiative - Implementation of Ananda Lahari Abhyasana (ALA) Programme in all Districts - One day review meeting with all key stakeholders Master Coaches and Demo School Teachers on 16.02.2018 at Kay Hotel, Vijayawada Orders issued - Reg. 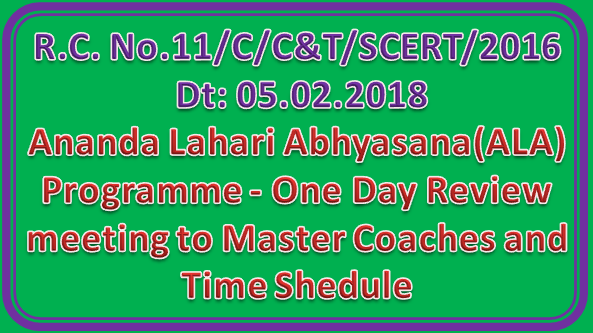 The attention of all the Regional Joint Directors and District Educational Officers in the state is invited to the above subject that, to review the status of implementation of quality initiative “Ananda Lahari Abhyasana (ALA)” in 1342 Primary Schools in A.P, a one day review meeting is scheduled to conduct on 16.02.2018 at Kay hotel, Ramavarappadu Circle, Vijayawada from 09.30 am to 05.30 pm. In view of the above District Educational Officers are requested to depute the following individuals to the above review meeting. RIVER and RIVER TIDE organizations are requested to attend the meeting with your district, zonal and technical teams to the meeting with your feedback reports State Project Director SSA is hereby requested to depute ALA coordinators from SSA, AP, Arnaravati to coordinate with SCERT and RIVER teams on various agenda items annexed to these proceedings.